In 1869, Leo Tolstoy completed his magnum opus War and Peace. Perhaps the most widely-known Russian novel, War and Peace tells the story of the Napoleonic invasion of Russia in 1812 through an intricate narrative that revolves around the lives of five aristocratic families. The novel’s plot climaxes when the Russian and French armies clash in the village of Borodino outside Moscow. The ensuing Battle of Borodino became one of Europe’s bloodiest conflicts and preceded the end of Napoleon’s military success. History continues where Tolstoy’s novel ends. Napoleon’s soldiers were ultimately defeated in Russia by the army of Tsar Alexander I. Many of the Russian military officers at the time were young men like the fictional characters in War and Peace. Russian forces pushed the French troops west across Europe and marched victorious through Paris, an event which signaled the fall of the Napoleonic Empire. While in Paris, Russian officers became acquainted with the Enlightenment and the French Revolution. They returned home with dreams of transforming Russian society, which still remained tightly-controlled by the tsar and the oppressive nature of serfdom. They formed secret societies and talked of revolution. And when Tsar Alexander I died in November of 1825, the men decided to start an uprising in December to take over Russia. On December 14, 1825, this group of rebellious young officers marched into Senate Square in St. Petersburg with a band of Russian troops. A standoff between the revolutionaries and Russian forces loyal to the new Tsar Nicholas I lasted throughout the day. Nicholas I eventually told his soldiers to fire and the uprising was easily dispersed. The men behind the December 14th uprising became known as the Decembrists. 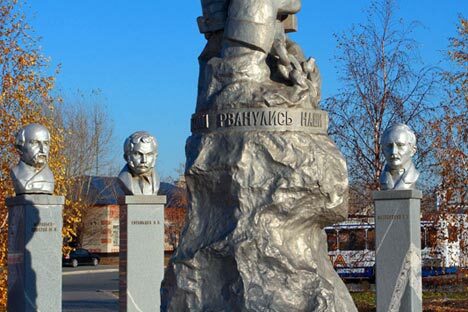 Over one hundred of them were arrested, tried, and sentenced to exile in Eastern Siberia, mainly in and around the cities of Irkutsk and Chita. During their exile, the Decembrists enjoyed a great deal of freedom. Some received money from family, and they split these remittances together in order to enjoy an equal standard of living. Their wives were later permitted to join them in Siberia and they raised families together. In their isolated new homes, the Decembrists enjoyed relatively peaceful lives writing, studying, playing music, and working the land. Despite their failure at sparking revolution, the Decembrists live on in the Russian memory for their youthful idealism and love of Russia. Tolstoy once considered writing an entire novel about their lives. Monuments and museums, mainly in Siberia, have been built to preserve their moment in Russian history. And to this day, many Russian cities still contain a street bearing the name, Dekabristov, or Decembrist. Over the years, historians and travellers alike have sought to learn more about the Decembrists by visiting the places where they passed their post-revolutionary lives. A natural place to start an independent tour through the life and times of the Decembrists is Senate Square in St. Petersburg where the uprising occurred almost two centuries ago. Senate Square ( Senatskaya Ploshchad, Metro Admiralteyskaya, Line 5 ) rests on the Neva River before the Senate and Synod building, a imposing edifice lined with Corinthian columns built in 1834. Their rebellion inspired future revolutionaries, and in 1925 the Soviets renamed it Decembrist’s Square. After the Soviet Union fell, the name was changed back to Senate Square. St. Petersburg is an ideal city to begin a trip across Russia on the Trans-Siberian Railroad. Once your train reaches Siberia, there’s a number of interesting sites to help get a better sense of what happened next in the lives of the Decembrists. Once known as the ‘Paris of Siberia,’ Irkutsk has long been touted as the cultural capital of the region. The Decembrists helped create this image by sponsoring balls as well as theater and concerts. Decembrist seekers in Irkutsk should start with a visit to the Volkonsky House-Museum ( Per. Volkonskogo 10 ). When the uprising failed, Decembrist Sergei Volkonsky fled home to visit his family one last time, believing he would never see them again. But Volkonsky was eventually permitted to live with his wife and children in this estate-turned-museum. On display inside are numerous photos of Decembrist families as well as the furniture and everyday objects the Volkonsky’s used in exile. Had the plot to overthrow Nicholas I succeeded, the Decembrist Prince Sergei Trubetskoy would have become Russia’s interim leader until a new government was formed. Volkonsky and Trubetskoy were neighbors, and the Trubetskoy House-Museum ( Ul. Dzerzhinskogo 64 ) is a just a block away from Volkonsky’s former residence. Almost thirty years after the failed uprising in St. Petersburg, Trubetskoy was permitted to take up residence here with his wife in 1854. A day’s train ride east of Irkutsk, the city of Chita lays nestled in a stretch of forested mountains north of Mongolia. Eighty of the Decembrists arrived to this former mining town in 1827, and their wives and lovers followed. Often called the “City of Exiles,” the Decembrists put distant Chita on the map and even contributed to its urban planning. The city’s Decembrist Museum ( Ul. Dekabristov 3b ) is located in the Archangel Michael church, a beautiful wooden building with onion domes completed in 1776 that is worth a visit in itself. The Decembrists were housed nearby and came to pray here. Inside this church Decembrist Ivan Annenkov married the Frenchwoman, Paulina Gueble, who came all the way to Chita to reunite with him. The museum contains detailed exhibits on the Decembrists as well the document that proclaimed their exile.